We haven’t had butterflies as a challenge for some years at FSC, and I think most people have at least one butterfly stamp! Do you? My card fits beautifully with International Women’s Day I think…and I have really enjoyed how women of all ages are starting to embrace this time and support each other in so many ways. A shout out to my friend Jenny who is involved with “Around the World with 80 Artists” where a proportion of the funds go to the Malala Fund to help educate girls…well worth checking out! I had absolutely no idea what I was going to put in the background! That’s a first for me, it’s usually the other way around. After cutting it out I thought that maybe I could layer it up somehow…nope…it wasn’t working for me. ~ then I thought perhaps I could create a mixed media piece with it…nope…so I walked away for a day or so, as you do. Finally, I settled on a one-layer card as the way forward for me. So I re-stamped the whole piece again and started over. The butterfly is wet embossed. The left side of the butterfly was coloured using Inktense pencils and DI (used as a watercolour)…for a punch of brightness. The right side, which was only half inked up, was masked and stamped with the lady in grey ink and then the face stamp in black ink. The background colours, yellows/oranges and grey, were chosen from the main image. Then it was a matter of stenciling, stamping with print and Finnabair circles, splats with Color Bloom spray, inked lids for circles and some spritz and flicking with bleach. So I guess really it is a mixed media piece after-all. And it didn’t quite end up as a one-layer piece…as the printed circles were cut out and stuck on…so close! This beauty just popped up in my reader Dot and I just love it! The butterfly is so gorgeous and your background looks amazing! Ooops! Just noticed you entered our Stencils and Masks Challenge! Thanks for joining in and lovely to have tou with us. Wow Dot, this is incredibly clever, my jaw just dropped when I saw it. 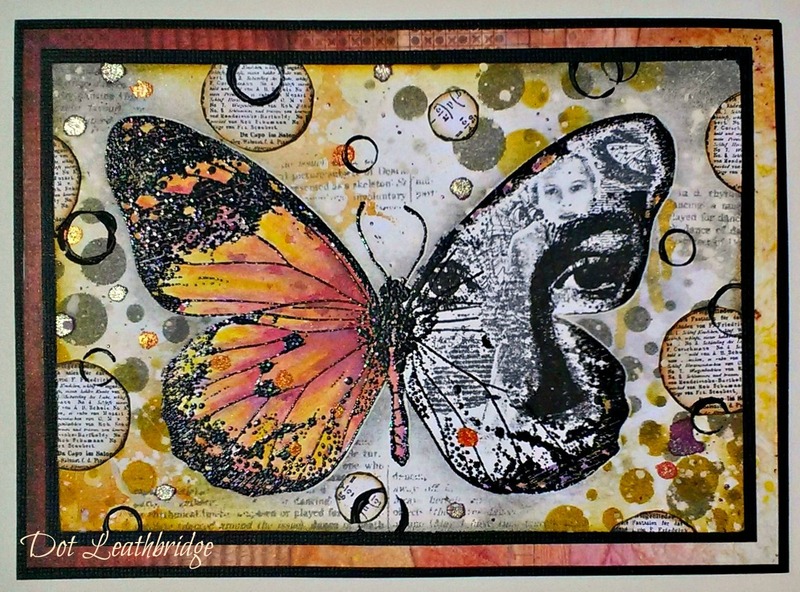 The way you did that butterfly looks amazing, so, so clever, I adore this piece, it's stunning!!! Absolutely stunning Dot, was a fabulous idea and so expertly stamped. Hi Dot, your card is fantastic. The butterfly and the background, what a great idea… WOW. Beautiful design, love the image !! What a marvellous inspiring idea with the combined butterfly! !The whole composition lloks very expressive. I find all of your artwork stunning Dot and this is another exceptional piece. Fabulous masking and stamping. I love it! :). Absolutely stunning, love the Butterfly and all the sparkle. With gorgeous colours. Stunning piece Dot, love how you've stamped the butterfly, looks amazing. The background has a wonderful depth to it. Beautiful card! I love the coloring on your butterfly and that gorgeous background! Thanks for sharing it with us at Cards in Envy! I am in awe, so gorgeous! Fabulous card, Dot! I like how you only coloured one wing. 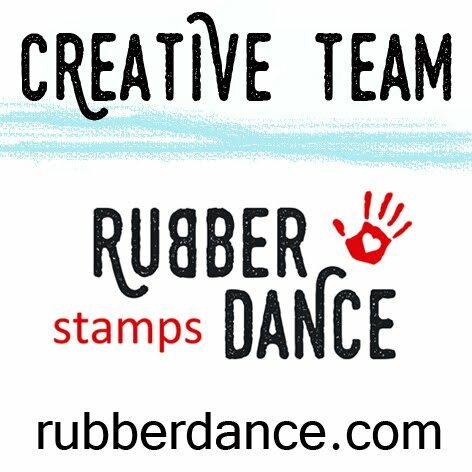 Thanks for playing along at Craft Stamper! An absolute jaw dropper Dot another creative piece with lots to keep coming back to have another look at. Love this! Turned a beautiful butterfly into something splendid. The contrast between the two wings is fabulous.